update - it looks like they will offer this car around the world. I am not sure how much they really looked into the US rules and regulations. Someone might not fully understand US DOT and EPA regulations. In response to an e-mail query from Inside Line, Nissan Americas Vice President David P. Reuter said: "We will make Juke-R available to customers anywhere in the world on a build-to-order basis. It is intended for serious collectors and investors who want to own a true original, an innovative project that will only be created in extremely small numbers." Reuter said the Juke-R will be priced from around $590,000. File this under the, never expected to see this. The Nissan Juke-R is going to be built in a "very limited" production for customers in the Middle East, and Europe. The Inside Line story doesn't have a lot of details, except that there are not plans for the US, and it is going to be built on a 2012 chassis. 2012 overseas is the US 2013, or 545hp version of the car. So I expect to see some 1000 hp Juke-R's doing some damage in the Middle East soon. The Nissan Juke-R will be available as a custom build-to-order car for European and Middle East customers, said Nissan on Thursday, as it bows to pressure to make the high-performance vehicle a reality. A Nissan Americas spokesman told Inside Line that it has "nothing to announce about U.S. availability at this point." The Juke’s marketing manager, Gareth Dunsmore, said "with such a strong reaction, and with three genuine offers on the table, we decided we had to make the concept a reality." AutoCar UK: It is the Juke-R’s performance in these videos that has piqued interest in the car, particularly in the Arab state. The Juke’s marketing manager, Gareth Dunsmore, said “people were making offers for the original on the street”. Nissan is to build the cars upon request and orders can only be placed in the next four weeks. No price has been confirmed by Nissan, but it’s likely to be a substantical six-figure sum. 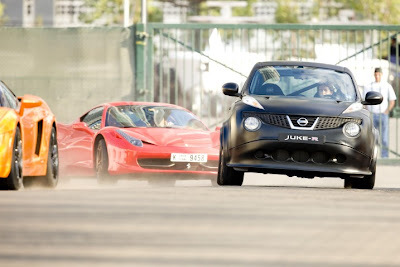 Top Gear: We can vouch for this - when we sent Ollie Marriage out to Dubai in one of the Juke-R concepts to race some young pups in supercars, he was offered a seven figure sum on the spot. And the figure didn't even start with one. Or two.